If you’ve been following along with the Superman comics recently, you’ll know he’s having a hell of a rough time. He’s been de-powered, the world hates him, and he’s even had to get a new secret identity after Lois Lane outed Clark Kent as the Man of Steel. But it seems like DC aren’t quite done kicking Superman just yet. Spoilers ahead for Superman #46, by Gene Luen Yang, Howard Porter, and Hi-Fi. Superman’s rough few months has seen the Man of Steel move to Oakland in an attempt to put his life as Clark Kent behind him—as well as keep the people who knew him safe, now that his identity is out in the open. He’s found an enclave of super-powered beings running a faux-wrestling circuit to latch on to, and in the process, it’s the happiest (and most popular) Superman has been for quite some time now. But despite all of his best efforts, Superman can’t quite so easily walk away from his past—especially when part of that past is his persistent best friend, Jimmy Olsen. Jimmy, who like Clark, got fired from the Daily Planet (because he knew Superman’s secret identity and didn’t tell his boss Perry White), has been trying to track Clark down, in order prove to the world that Superman is a good person. It’s actually sort of heartbreaking, because you finally realize just how much Clark means to Jimmy—and how having his life destroyed by the shadowy villains behind Clark’s recent troubles has left equally huge problems in its wake for the people Clark surrounded himself with. It’s even worse when Jimmy’s naive thought that Clark would return and everything would be fine blows up in his face—when Superman makes him realize that he’s not going to come back, no matter what Jimmy does. But as Clark’s best friend, Jimmy Olsen is nothing if not persistent. And that persistence may have just got him killed. And hits Jimmy, who’d tailed Superman throughout the night, right in the chest. Sure, this isn’t even the first time Jimmy Olsen has died in the comics—and, presumably, he’s either going to not be dead for long, because comic booooooks, or just somehow really badly injured (which would be a bit of a cop-out, considering the gaping chest wound he has on the last page of the issue). But for now, it’s made Superman’s pretty miserable situation somehow even worse. Can Gene Luen Yang kick him while he’s down even harder than this? I guess we’ll have to keep reading to find out. 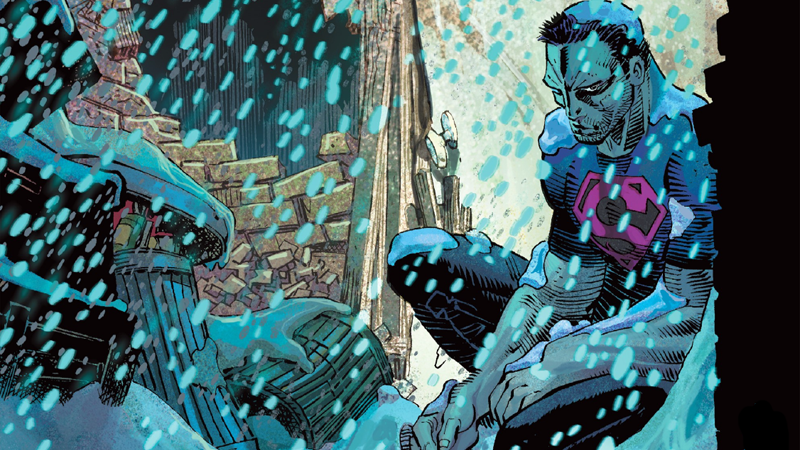 Header Image Credit: Superman #46 cover by John Romita Jr., Klaus Janson, and Dean White.